Throughout its rich and vibrant history, Baltimore has been known by a variety of names: Mobtown, the Land of Pleasant Living, or Charm City to name just a few. Perhaps "Beer Town" would have been more appropriate. Several pivotal events in Maryland's history involved the brewing industry. 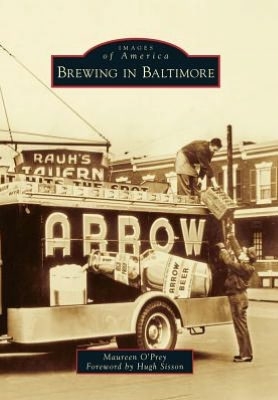 Baltimore brewers were vital to building the fledgling town into the bustling city it is today. These brewers established some of the earliest churches in Baltimore. Eagle Brewery's Harry Von der Horst helped build the Orioles into a pennant-winning team in the 1890s. Mary Pickersgill sewed the stars upon the Star Spangled Banner on the floor of Brown's Brewery during the War of 1812. Today, locals recognize the iconic Natty Boh as one of their own; his winking eye still keeps watch over Baltimore. Some may even recall brands like Globe, American, or Gunther. With images provided primarily by the Baltimore Museum of Industry, natives and visitors alike will reacquaint themselves with Baltimore's malted roots, legendary brewers, and those that continue the tradition today. As a historian and local who witnessed many of these brewing institutions come and go, author Maureen O'Prey brings this oft-overlooked history to light.